Heat Olive oil in a pan and add onion and garlic. Fry well and add chilli powder and kidney beans. Cook it for 5 minutes and add vegetable stock. Now add milk and let it boil for 5 minutes. Cool the mixture and blend it to smooth soup. Garnish soup with salad onion and serve with salt and pepper. 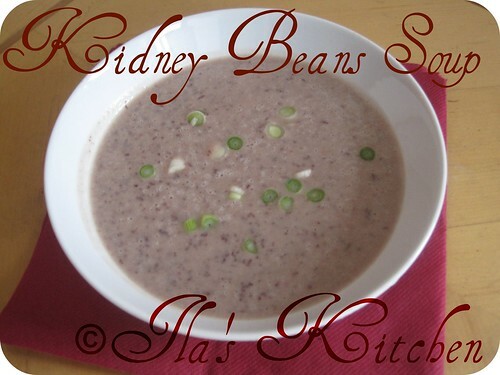 This healthy soup can be served for evening refreshment with salad onions. SOup looks super healthy and filling.. Very innovative recipe it looks delicious. healthy and wholesome soup!...nice one! 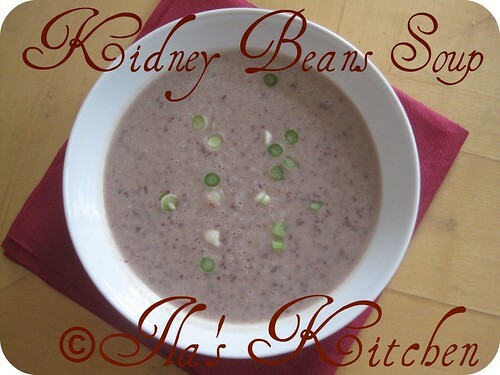 Kideny beans soup looks awesome healthy. Very healthy & filling soup! Very power-packed soup....Good for breakfast! What a delectable soup..i love rajma ( kidney beans ) and this sounds like a good excuse to have some more of it!!! Congrats on the milestone, Ila! The soup looks hearty and tasty! That's a soup with protein punch.